We have had a birthday boy in the house this month. I honestly do not remember him being so excited about a birthday before. I also do not remember ever struggling so much to come up with birthday present ideas before either. All he wanted was a venus fly trap. We managed to get that sorted but then what else? 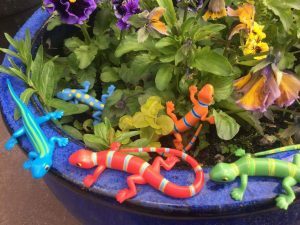 He loves to be outside and has become more and more involved in creating all sorts of homes for different bugs and animals. 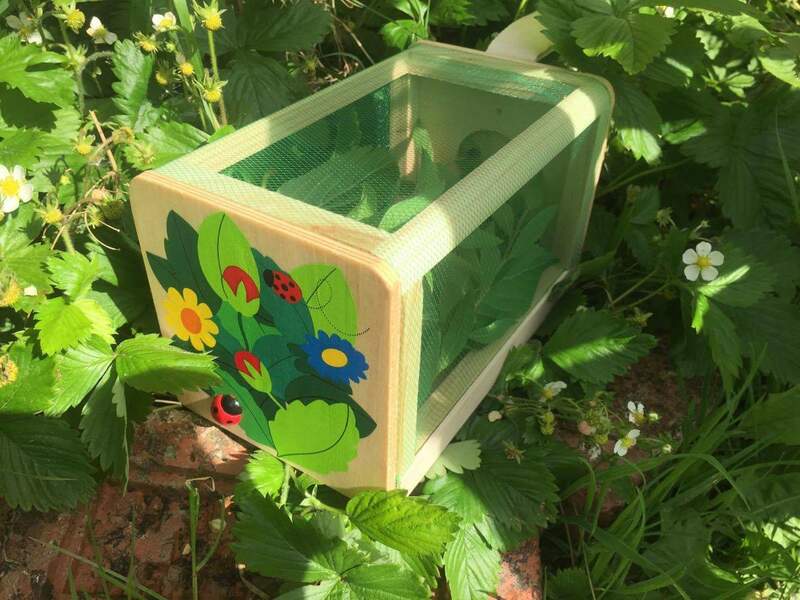 We recently made a hedgehog cafe and a bug hotel so I wanted to encourage this love and all things bug related. Magic Fairy wings sell a bug house. This is perfect for him and his bugs. 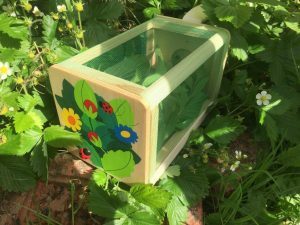 A beautiful box, decorated in fine detail with sides that allow air to get in. A small hole to add grass and leaves and of course to release any bugs back safely into the garden. This was a perfect present for him. He was over the moon with it and within the day it was stuffed with all sorts of leaves and sticks from the garden, ready to welcome any bugs he finds. Every bug hunter needs a magnifying glass to help them when looking for new bugs. 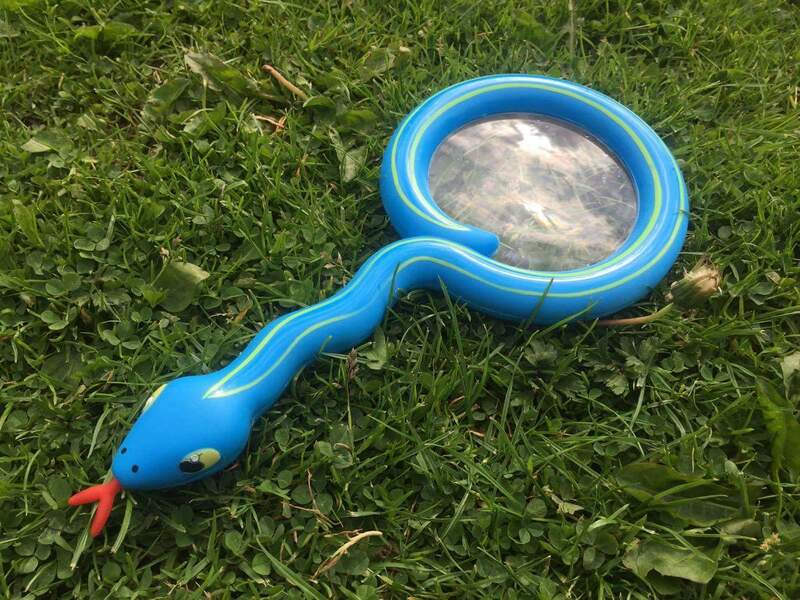 I got Dylan the Melissa and Doug magnifying glass from Magic Fairy wings that looks like a snake. 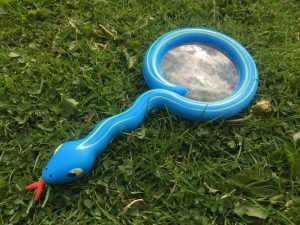 A great magnifying glass but probably more suitable for younger children. Its worked out well here as Dylan got another magnifying glass as a birthday present so he has been using that one and Matilda has been copying him with the Melissa and Doug one. The final gift and it actually surprised me as I did not think it would of been such a big hit was a bag of toy lizards, they don’t do anything in particular. A toy for the imagination. They fit perfectly in a child’s hand or a pocket. Chunky and brightly coloured. Both children have enjoyed playing with them. I keep finding them in random places around the house and garden. The most recent place was a flower pot and the sandpit. They also seem to be very popular in the bath. You can get all of these items now and if you use the code EBF10 at checkout you get 10% discount until the 30th of June. Pop over to www.magicfairywings.co.uk and have a look, lots and lots of toys and children’s products to choose from. I love the little magnifying glass, my two would adore something like that. I might have to make use of your discount code for Libby’s birthday, thank you!